The work is inspired by the original memory groves on Bornholm, that merge into the nature. The boundary between art and nature has been abolished to create a unique place to find peace and remember life and afterlife. SILENT MEMORIES consists of a circle of sandstone from Nexø, the artist's birthplace. As a shadow on the back of the stones, mirrors are placed in the vegetation. The mirrors reflect the stones, the tree tops and the viewer - thus creating a connection between earth and sky in a fleeting infinity. SILENT MEMORIES is inspired by the Iron Age Dommaring (a circle of stones), where the bautast, especially on Bornholm, was set as tombstones in circles to mark the relationship between family and parish. They are situated on Hjortebakken in Bodilsker and in Gryet near Nexø. The stones stand anonymous as opposed to today's burial sites. Building a wall is a very bodily experience and Anne Nowak takes it to another level. The Cosmic Wall by Danish artist Anne Nowak comments on xenophobic US policy, its alienating effect and future perspectives. The installation & performance shows the stupidity in building walls, dividing and excluding rather than welcoming strangers. 250 bricks in cosmic paint is assembled and disassembled as a wall, 2 times a day for 2 hours. 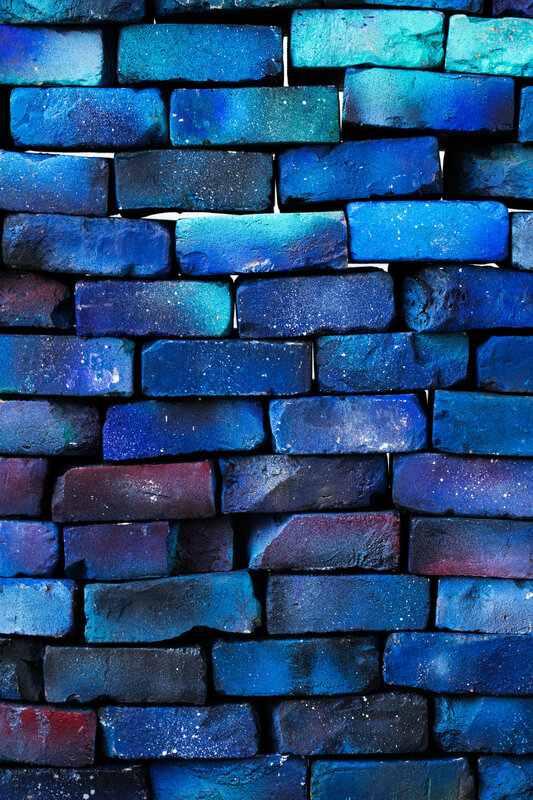 The bodily experience of building a wall is taken to another level at SPRING/BREAK Art Show where Danish artist, Anne Nowak, will move 250 bricks two times a day for her performance The Cosmic Wall. Why? As a comment on the alienating, excluding effects of the borders currently and historically being built around the world. The old, worn bricks are spray-painted in cosmic, bluish colours, making them look like a piece of the uni- verse, light, easy and something from outer space. Throughout the SPRING/BREAK Art Show, Anne Nowak who is recognised for her cosmic atmospheric works, will assemble and disassemble a wall on site, again and again and again. Brick by brick, it is torn down and rebuilt next to where it was. This is repeated in a Sisy- phus like manner. The driving force behind The Cosmic Wall is the Danish fine arts curator, Henriette Noermark, who found that Nowak’s work spoke directly to the theme of this years SPRING/BREAK Art Show ’Strangers Come to Town’. The exhibition brings together works that, in different ways, circulate on topics such as xenophobia, migration, assimilation and fusion or dissolution of diversity. ”History is full of examples of how man has built walls as a shield against the unknown. Anne Nowak’s per- formance destroys the wall, stone by stone, and articulate issues as seen from the stranger’s perspective,” says Henriette Noermark, adding that the repetition in building the wall up and pulling it down several times a day adds another dimension to the discussion. ”I was young in the eighties, in an age when it was about tearing down walls, abolishing borders and seeking community and diversity. That is the spirit I would like to pay tribute to, ”says Anne Nowak about the inspiration behind The Cosmic Wall. The physical challenge is overt for visitors: ”I have come to the conclusion that, overall, I will move around over a ton of bricks every day during the exhibition. Although the stones are light in their expression, they actually weigh more than 6.5 lbs. each. Seemingly porous as there is no mortar binding the bricks together, the wall is still heavy and it will be my most bodily work to date,” says Anne Nowak. It is not only the artist who can take an active part in moving the wall. At the end of the performance, visitors can buy a piece of the cosmic wall to bring home. Like that we break down the wall for good, together. Henriette Noermark works independently out of Copenhagen and her curatorial practice is specialized in the field between contemporary art and crafts. With previous and upcoming exhibitions at Patrick Parrish Gallery, Tribe- ca, and a former association with Residency Unlimited, she is well versed on the New York art scene. She invited Anne Nowak as her artist for this year’s SPRING/BREAK Art Show. Opening on the 18 th of June 2-20. ANNE NOWAK VENDER HJEM TIL SIN FØDEØ MED SOLOUDSTILLING “OF THE SOUL” PÅ R2 GALLERI I SVANEKE. Livet efter døden, fravær og nærvær er temaerne i den bornholmskfødte kunstner Anne Nowaks første soloudstilling, der viser de to omfangsrige værker ’Dead peoples dead flowers’ og ’Soul Maps’. Det er emner, der har optaget hende i mange år, og interessen blev forstærket, da hun mistede sin far. ”Man taler så sjældent om, hvad man tror på. Er der et liv efter døden? Sker der mere end blot det, at man dør og bliver lagt i graven? Siden jeg mistede min far, har jeg haft en følelse af, at han er der alligevel. At hans sjæl er nærværende. Måske er det bare noget, jeg forestiller mig og har et brændende ønske om – men det betyder ikke noget. Det afgørende er, at det er der,” fortæller Anne Nowak. Udstillingen åbner 18. juni på R2 Galleri i Svaneke ganske tæt på Nexø, hvor Anne Nowak (f. 1976) er født og vokset op. Med en uddannelse som tekstildesigner og kunstner har hun arbejdet i mange genrer fra håndtrykte tekstiler til vægudsmykning og print. Hendes kunstneriske karriere tog for alvor form, da hun i 2009 deltog på forårsudstillingen på Charlottenborg med skulpturen ’Kuglen’. Siden har hun blandt andet haft succes med en række værker, der fortolker universet og planeterne omkring os. I dag er hun bosat i København og har galleri og værksted på Frederiksberg Allé. Værket ’Dead Peoples Dead Flowers’ har tidligere været udstillet på Spring Break Art show under kunstugen Armory Week i New York i 2015. Det består af en række blåtryk af tørrede blomster, som Anne Nowak har samlet i komposten på forskellige kirkegårde. Blåtrykket er en meget tidlig fototeknik, der får et negativt billede til at træde frem ved hjælp af lyspåvirkning på papir bearbejdet med kemikalier. En på samme tid konkret og abstrakt belysning af fravær, der fletter sig ind i ønsket om at føre nyt liv i de dødes døde blomster. Værket er under konstant tilblivelse. ’Soul Maps’ er et nyt værk, som har været undervejs det seneste år. Igen er fraværet i fokus både tematisk og teknisk. Ved brug af en særlig tekstilteknik, der brænder silken væk fra velouren, laver Anne Nowak serigrafiske tryk i stoffet. Siden spænder hun det ud i runde rammer, der egentlig er beregnet til broderi og quilte. De mange rammer danner hver sit sjælekort, der svæver sammen i rummet som en enorm uro. ”Det er den helt rigtige måde at komme hjem på, og det gør mig glad helt ind i sjælen. En stor del af min inspiration kommer fra Bornholm, så jeg glæder mig utrolig meget til at komme tilbage og vise, hvad jeg lavet,” siger Anne Nowak. R2 Galleri ligger i et gammelt pakhus i Svaneke og udmærker sig som galleri med et særligt lysindfald og atypiske, atmosfærefyldte rum. Galleriejer og billedkunstner, Stig Rex Thomsen, udstiller primært kunstnere med bornholmske rødder, og han glæder sig til at invitere Anne Nowak ind i rækken af kunstnere, der er formet af og former øens særlige stemning. “Anne Nowak arbejder i spændingsfeltet mellem kunst og design og formår med sine personlige og overraskende teknikker at udfordre rummet i mere end én forstand. Hendes værker er kendetegnet ved en grafisk renhed og en poetisk fornemmelse af materialet. De åbner de store, filosofiske spørgsmål om liv og død og mennesket i forhold til universet,” siger Stig Rex Thomsen, der mener, at de fysiske rammer og værkerne kan noget særligt sammen. “Når man som Anne Nowak er født og opvokset på Bornholm bliver man konfronteret med naturen og nattehimlen, som her fornemmes stærkere end mange andre steder. Anne Nowak har givetvis allerede som barn stillet sig selv nogle af de spørgsmål, der optræder i hendes univers i dag,” siger han. 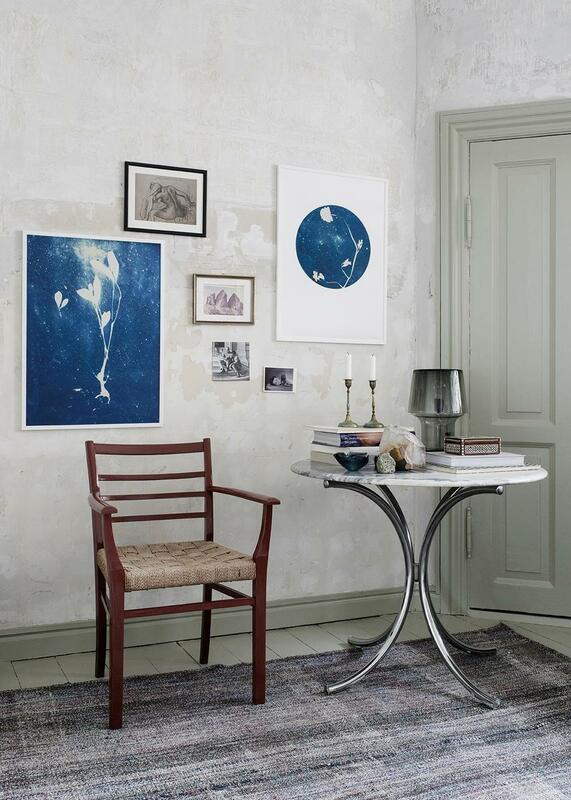 Udstillingen åbner 18. juni og bliver vist frem til 13. juli på R2 galleri , Søndergade 2, 3740 Svaneke. Åbningstider: Ons-Søn 11-17. Torsdage 11-21. Fernisering under Folkemødet: Lørdag 18. juni fra kl. 14 og frem. Kontakt: Stig Rex Thomsen, srexth@gmail.com, +4527101190. Anne Nowak has created two new art prints exclusively for THE POSTER CLUB. The two art prints are both from the flower print series Dead People’s Dead Flowers, which Nowak exhibited at The Spring Break Art Show in New York, during Amory Week 2015. In collaboration with THE POSTER CLUB, two of these unique art works have been transformed into two limited edition art prints. "Over the course of a year Nowak has collected withered flowers from graveyards and pressed them. Using the photographic process known as 'blueprint', she has made negative prints of flowers and artistically processed the outcome. Her work has brought life into dead people’s dead flowers and by doing so Nowak casts a both abstract and concrete light on the condition of absence”. Anne Nowak’s aesthetics reflects a fascination towards the outer hemisphere. In a poetical manner, she creates magnetic works which invite the viewer on a mystical journey into micro universes of suns, moons and planets. The print series Dead People’s Dead Flowers resemble the atmospheric poetics of Nowak’s style. Floating around in outer space or under the surface of an endless ocean, the two prints portrait the flowers in a glorious moment of their journey towards decay. The two new art prints are made in a limited edition of 350 individual prints. 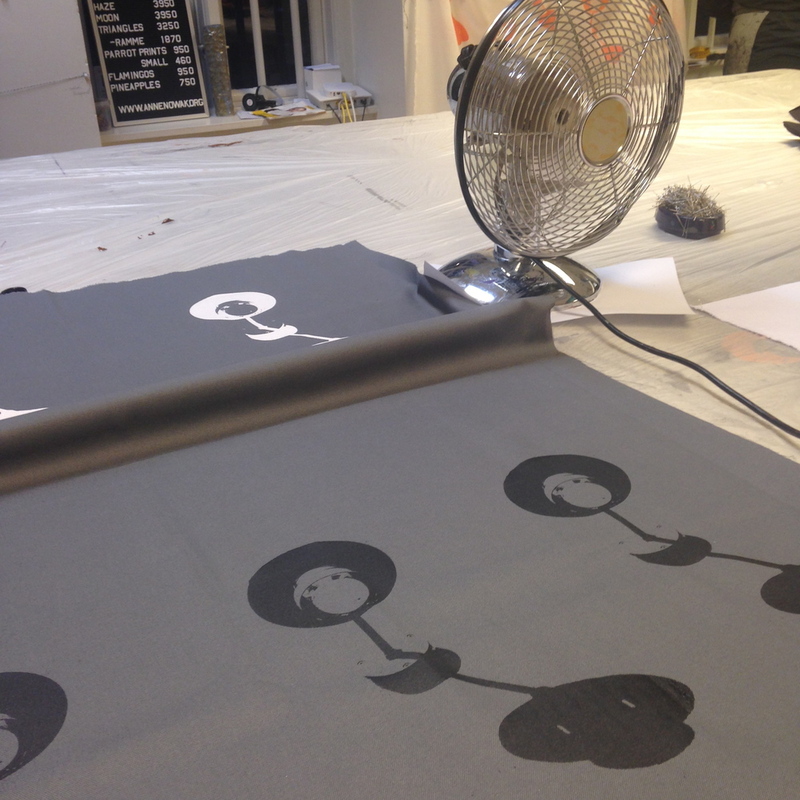 Each print measures 50x70 cm and is printed on Fuego Matt White 200 gsm paper. The retail price is €90. The prints are available worldwide via theposterclub.com and can also be acquired here. THE POSTER CLUB is a copenhagen-based online store with an exclusive and handpicked selection of design posters and art prints from various artists, designers, photographers and other creatives. The photos are styled by talented interior stylist and designer Nathalie Schwer (http://cargocollective.com/nathalieschwer) who is a regular contributor to both Cereal Magazine and Kinfolk. Her creative and eclectic aesthetics infuse her way of styling and this is reflected in the photos, which have been shot in her beautiful home in Copenhagen. Photography by Christian Høyer (www.christianhoyer.dk). Limited edition art print by Anne Nowak. The art print can be purchased here. Bo Bedre, Costume Living & Bolig Magasinet har lavet et show hvor de hylder dansk design lige nu. Showet bliver afholdt på Paustian torsdag d. 10.09. Man fornemmer en nærmest barnlig begejstring og charmerende nysgerrighed over tekstildesigner og kunstner Anne Nowak og den måde, hun bruger sit håndværk til at udforske verden på. De enkle motiver i hendes grafiske værker har en imponerende dybde, fordi hun virkelig mestrer sine materialer og sit håndværk. These new unique prints are a part of a series of planets and moons. Soon to be at Stilleben and in my webshop. Titan is one of the many moons around Jupiter. The piece is the only one of its kind as it is part of a series of variants . All variants are unique and varies a bit from the photo. . The measurements vary around 38 x 56 cm. as Anne Nowak gently tears her artworks out of large paper pieces. "Sunset" is piece is the only one of its kind as it is part of a series of variants . All variants are unique and varies a bit from the photo. . The measurements vary around 38 x 56 cm. as Anne Nowak gently tears her artworks out of large paper pieces. "Mars" is piece is the only one of its kind as it is part of a series of variants . All variants are unique and varies a bit from the photo. . The measurements vary around 38 x 56 cm. as Anne Nowak gently tears her artworks out of large paper pieces. "Sun" is piece is the only one of its kind as it is part of a series of variants . All variants are unique and varies a bit from the photo. . The measurements vary around 38 x 56 cm. as Anne Nowak gently tears her artworks out of large paper pieces. 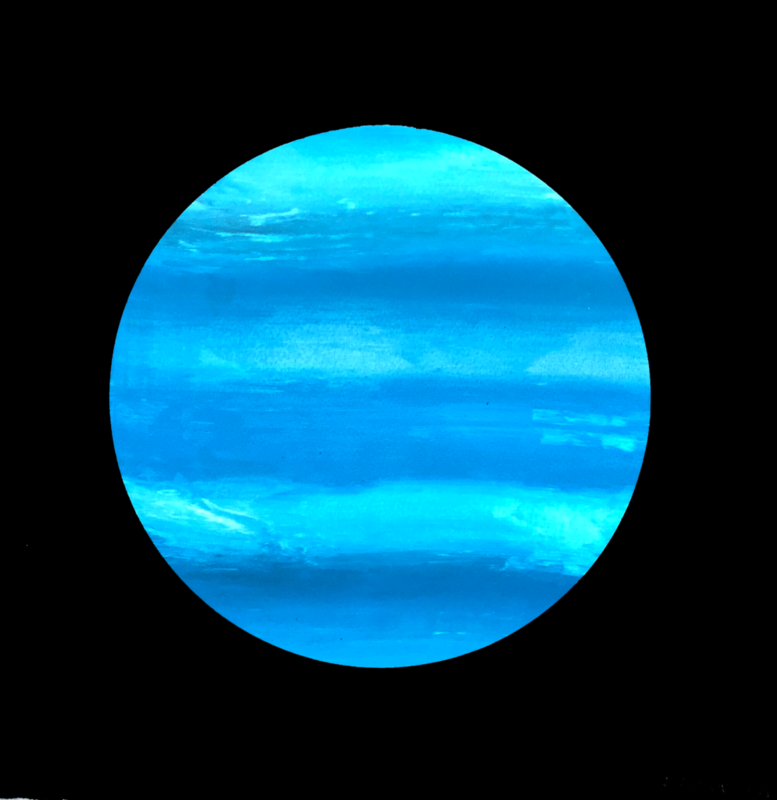 "Neptune" is piece is the only one of its kind as it is part of a series of variants . All variants are unique and varies a bit from the photo. . The measurements vary around 38 x 56 cm. as Anne Nowak gently tears her artworks out of large paper pieces. Front page in Bornholms Tidende. Such a lovely front cover in Bornholms Tidende about the "The Dead People´s Dead Flowers". This Sunday Berlingske brought an interview about my project The Dead People´s Dead Flowers. The Spring Break Art Show was an incredible show taking place in the abandoned offices inside the amazing Post Office Building with old office spaces still having their glass-windowed doors, wood-paneled walls etc. Around 400 artists showed their works in the old offices. I had my exhibition in one of those offices. Dead People ́s Dead Flowers is a calm, poetical story about death and afterlife. Over the course of a year designer Anne Nowak has collected withered flowers from graveyards and pressed them. Using the photographic process known as 'blueprint', she has made negative prints of flowers and artistically processed the outcome. Her work has brought life into dead people’s dead flowers and by doing so Anne Nowak casts a both abstract and concrete light on the condition of absence. Flowers like roses and carnations might be common on the graveyard, but each of them become something else and bring forth their own new and unique shape and story, as they gather and float in the sky. In conjunction with the 2015 SPRING/BREAK Art Show, The Varsity presents The Dead People’s Dead Flowers, a new installation by Danish artist Anne Nowak, curated by Cassandra M Johnson. In Nowak’s haunting installation, the artist has adopted a radical approach to artistic production. By collecting source materials from the garbage, discarded dead flowers from graveyards, over the course of a year and transforming them into works of art, the installation operates within the public sphere, creating work from materials not necessarily associated with art, but with everyday life. Comprised of over 150 cyanoprints, which hang from the ceiling on invisible lines, the work reacts organically to changes in the air and the movement of people throughout the space. This subtle billowing effect literally and figuratively breathes new life into what has passed on, casting both abstract and concrete light on the condition of absence. Insofar as the process of sourcing these materials infiltrates alternative systems of exchange (dumpster diving, freeganism, etc. ), the project raises questions of ownership and the life cycle of material objects, including works of art, and their value as both commodity and private property. The moment Nowak removes the discarded flowers from the garbage, they are transformed from dead, withered objects and given new life in the eyes of the artist. This body of work challenges the power of truism in the valuation of objects. What value does an object have when it is no longer able to serve its initial purpose? In the valuation of art, exchange value is tied above all to aesthetic judgment, in parallel, these forsaken flowers are no longer deemed valuable once their aesthetic qualities have faded and their perceived purpose is achieved. The flowers themselves, exhibited alongside the prints, appear at first glance to be a very trivial thing, and easily understood. Though they are altered, cut and precisely arranged, the natural form of the flowers remains a common, every day thing. Valued by their intended use, there is nothing mysterious about them, but when considered in terms of their capacity to be transformed through an alternate perspective, they abound in metaphysical subtleties and theological nuances. At the hand of the artist, they transcend their commercial purpose and challenge the viewer to resign any preconceived value judgments. The Dead People’s Dead Flowers imparts the possibility of a new relation to things, one which goes beyond the enjoyment of their use value and the accumulation of their exchange value. Here the artist becomes the redeemer of the abandoned object, the one who absolves, with her elegant treatment of these trashed flowers, their original sin: the commodity. The prints themselves become not only a testament to this new way of interpreting value, but an homage to the dead, an offering and tribute to the lost souls, the stars, and the unknown. The Varsity is a Brooklyn-based independent curatorial firm. Founded on the idea that conversations spark innovation, we produce exhibitions and events which bring together the ever growing community of creative thinkers we encounter. Our curatorial initiatives challenge and advance existing paradigms of exhibition making and forge relationships among artists, critics, exhibition spaces, and audiences, seeking to create a more connected artistic community. Copenhagen based Norm Architects just moved into a new studio, and look what they got. Moon and Haze!!! Til dem som godt kunne tænke sig at lære at trykke, lave deres eget design, blande farver og være kreativ på stof og papir..
På denne workshop kan du få indblik i den grundlæggende del af det at lave dit eget tryk på tekstil med serigrafirammer. Vi trykker på alt mellem himmel og jord - kun fantasien sætter grænser! Synes du det kunne være sjovt at designe dit helt eget stof eller vil du trykke fine T-shirts til børnene? Mulighederne er mange og det er en sjov verden at begive sig ind i.
Denne workshop kræver ingen erfaring med tekstiltryk. Jeg gennemgår de mest almindelige teknikker og procedurer trin for trin. Du skal medbringe dit eget motiv og lære at lave din egen ramme. Depositum på 500 kr betales ved tilmeldingen som er bindende. Depositum tilbagebetales kun ved afbud 14 dage før workshop. Resten af beløbet afregnes kontant, når vi mødes, eller sættes ind på kontoen eller mobilepay 23495851. Ved Afbud, sygdom, ferie mm, kan jeg desværre ikke tilbyde hverken penge tilbage eller ekstra undervisning en anden dag. Det er en bindende tilmeldning for det fulde beløb 1500,-. Du er velkommen til at give pladsen væk til en anden, hvis du selv er forhindret. Dette gælder 1 uge før den tilmeldte workshop. Det er muligt at få sit helt eget vægmaleri derhjemme hos sig selv. Jeg tager ofte ud til venner og bekendte, butikker, kontorer m.m. og maler direkte på væggene. Så stik mig endelig en mail, så kan jeg konkret give et bud på netop din væg. Vægdeko fra Kaffesyndikatet. Stof på blød masonit.